Deidra Reid was violently arrested by Orange County Deputy Richard Nye, but the State Attorney has dropped all charges saying “this case is not suitable for prosecution.” Reid plans to file a civil lawsuit. For months, there have been calls for justice in numerous cases involving Orange County Sheriff’s Deputy Richard Nye, who is accused of excessive force and abusing his position. In fact, 21 excessive force complaints have been filed against Deputy Nye in the past seven years, including two recent cases heading toward civil lawsuits against the deputy and the Orange County Sheriff’s Office. Last year, in a span of only two months, Deputy Nye was involved in two high-profile cases of excessive force. In July, college student Deidra Reid was violently arrested by Nye, who pulled Reid’s arm out its socket in a very controversial and seemingly personal take-down of the 21-year-old woman. Reid and her friend Reginald Lane Jr. were arrested and claimed Nye used excessive force. In September, Deputy Nye was then accused of beating a 17-year-old boy while deputies were searching for a 30-year-old suspect. Just last week, Erik Sandoval with News 6 reported State Attorney Jeff Ashton dropped all criminal charges against Deidra Reid. “From the investigation which has been made, it is the opinion of the writer that this case is not suitable for prosecution,” the state attorney’s office wrote in its notice filed with the court on December 23rd. “We will be suing them all for the harms they have caused her and her parents,” attorney Jackson added. 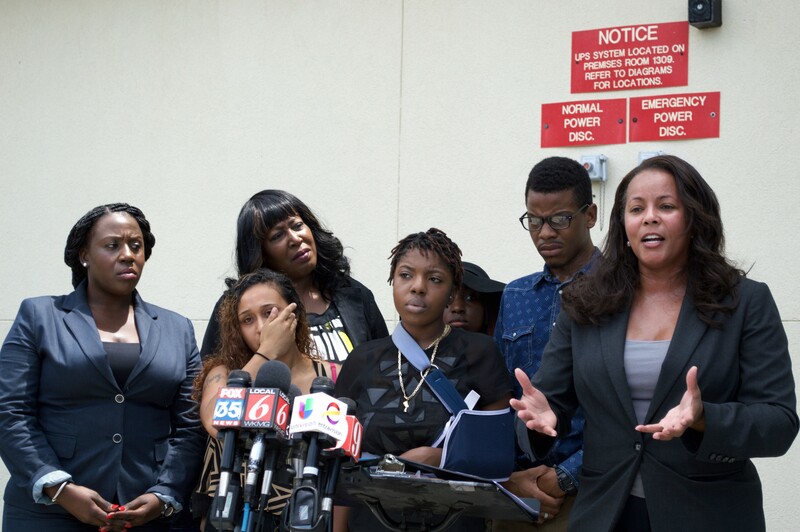 Attorney Natalie Jackson (right) with her clients Deidra Reid and Reginald Lane Jr. at a July press conference with NAN Central Florida President Lawanna Gelzer. Attorney Jackson also further explained the difficulties and injuries Reid suffered as a college student that was “falsely arrested” during her class finals. The deputy dislocated her arm, causing medical bills. Reid was also wrongly jailed, a traumatizing experience for someone with no prior criminal record and she was forced to use her hard-earned money to pay a bond as well as hire lawyers to defend herself and clear her name. Her mug shot was put online and she has a public arrest record that falsely labels her as a violent criminal, when the only violence from the incident was caused by Deputy Nye. Her studies has been impacted and her reputation has been tarnished because of a personal problem Deputy Nye had with her. “I think it’s outrageous conduct,” attorney Mark NeJame added. According to News 6, Orange County Sheriff Demings said at the time three deputies, including Nye, were the subject of an internal investigation to see if there was any wrongdoing. But after 21 excessive force complaints against Deputy Nye alone, it doesn’t appear Demings will be the one delivering justice or change for the victims. Demings even went so far as to demonize the victim, Deidra Reid, while defending his deputies after protests when the cellphone video went viral with students using #JusticeforDeidra on Twitter. 4 Responses to "Serious Concerns Surround Sheriff’s Deputy Accused of Excessive Force"
Police say they are concerned about what the public thinks about them and whimper about the lack of respect they are now receiving, yet, they continue to flaunt their overzealous actions back by lack of responsibility and lack of concern for anyone except themselves. The police are making more and more enemies with each successive irresponsible act…. There will be a tipping point, there’s always a tipping point. One day, whenever a cop makes some hapless citizen “fear for his life,” cops like the above will start dying. Consequently, “I thought he was going to pull his service weapon out and murder me …” will — for the most part — be considered by the average jury as a prima-facie cause for justifiable homicide. In addition, the executed cop’s estate will also suffer. After about several dozen cops loose their life in short order because of excessive force, maybe then LE’rs will learn that responsibility to the law is for EVERYBODY … especially them.